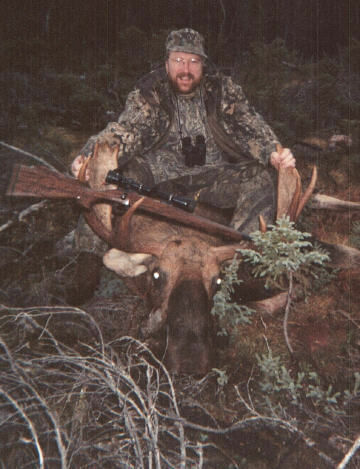 Eastern Canada moose, taken during the rut October 1999 in Newfoundland. The weather was AWFUL. My guide, Charly, called him up with a soup can and a hockey skate lace. Estimated 3.5 or 4.5 years old, netted 300 lbs. boned meat. They are considerably smaller then their western cousins, but absolutely delicious. A bit grainy in texture, but in flavor it tastes more like beef than venison.